The term dove refers to any one of more than 300 species of the Columbidae suborder of birds. The most common one, the ring-necked dove, makes a friendly, non-demanding pet that can be kept either indoors or outdoors. There are more than 300 separate species in this suborder of birds. The most commonly recognized domestic dove—the white dove—is actually just one of more than 40 different color mutations of the ringneck dove (Streptopelia risoria). While ringneck doves originally hail from Africa, there are other dove species indigenous to places all over the world. For example, fruit doves are endemic to Australia while mourning doves are one of the most prolific and widely recognized wild bird species in North America. Only the aridest areas of the Sahara and the coldest arctic regions are without some species of the Columbidae suborder. Different dove species prefer different habitats, and while overall this is not a group that is endangered, roughly 59 of the more than 300 species are threatened with extinction. In the wild, the Streptopelia risoria form that is native to Africa is highly dependent on the presence of water, and it eats primarily seeds, supplemented with fruits and berries. Provided enough water and food sources are present, it can inhabit nearly any environment, from grasslands to dense forests. This hardiness and adaptability makes S. risoria the favorite breeding stock for domestic doves. While different species of dove come in different sizes, as a general rule, most types of doves fall between 8 and 12 inches in length from the beak to the tips of the tailfeathers. With proper care, captive pet doves can live for as long as 25 years of age, although 10 to 12 years is more typical. Tame, domesticated, handfed doves are known for their sweet and gentle dispositions. Unlike parrots, softbills such as doves rarely try to bite or do damage with their beaks. Some doves can be a bit more nervous with people than others, but this can often be calmed by using positive socialization and bonding techniques. Because of their largely peaceful nature, doves can be a good choice as a pet for older children who understand how to be calm and gentle with companion animals. In the wild, a ring-necked dove sports dull tones of grey and brown over most of the body, with a darker collar on the nape of the neck. Pet doves can come in a rainbow of selectively bred colors and color combinations, including pure white, tangerine, pied, and orange. The most commonly recognized pet dove colors are white, gray, or a combination of the two, with various species-specific markings. The eyes are black, the bill is black, and the feet are dark purple. Males and females look alike, although males are slightly larger. Beautiful, charming, and easy to care for, doves make excellent pets for those who are interested in owning a pet bird but don't quite feel ready to take on a more difficult bird, such as a parrot. Doves are very common pets, and it is worth checking with rescue organizations and animal adoption agencies. These birds breed so readily in captivity that orphaned birds are frequently available. Doves are also easily found in specialty aviary pet stores and from breeders. Noted for their gentle dispositions and quiet, soothing vocalizations, a dove is an excellent choice as a pet for both young and older bird lovers. Like any pet bird, a dove does require plenty of attention and socialization, but this bird is more naturally suited to interacting with humans than some other bird species, and novice bird owners generally find it easy to train and bond with a dove. While doves don't typically display the comical antics of the hookbill species, they have charming personalities and with proper care can offer their owners many years of entertainment, love, and companionship. Doves can be kept indoors or outdoors. A single bird requires an indoor cage at least 24 inches square and 30 inches in height, although bigger is always better. If you are raising a pair of doves, an indoor flight cage that is 62 inches high, and about 32 inches square is suitable. Doves spend a lot of time on the ground, so a cage with a non-wire bottom is best. Equip the cage with a couple of perches to encourage flying between them. If kept outdoors, a custom aviary must be sturdy enough to keep predators out and must have shelter to protect the birds from the elements. If keeping more than two birds, it's recommended that the aviary provide about 4 square feet of floor space for each bird. Doves need companionship, and if kept alone indoors, they should be allowed plenty of free flight time out of the cage to interact with human caretakers. This bird does not require a lot of toys, but swings and mirrors within the cage are a good idea. Doves need considerable exposure to ultraviolet light provided by direct sunlight, which is not provided by sunlight filtered by glass. Birds kept indoors will likely need supplemental lighting provided by UV lights in order to avoid vitamin D deficiency. In the wild, most dove species subsist on a diet comprised mainly of fruits, berries, and seeds. Some species have been known to ingest the occasional insect, but most doves thrive on a vegetarian diet. Pet doves in captivity seem to do best on a high-quality seed mix (often marketed as a diet safe for doves, pigeons, or parakeets) supplemented with millet, commercial pellets formulated for softbills, and a variety of fresh, bird-safe fruits and vegetables. Doves are not chewing birds, so they do not require a lot of toys. They do, however, require plenty of free flight time for exercise. If kept outdoors, make sure the aviary is large enough to provide flight space. If kept indoors, your bird should be allowed several hours of out-of-cage flight time in a safe environment (makes sure they can't escape). 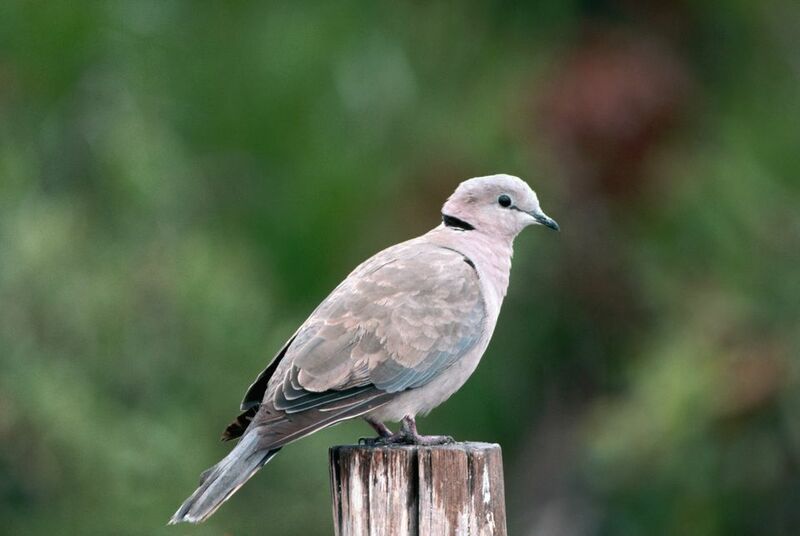 Doves are prone to infection from the parasite Trichomonas gallinae, commonly known as canker. Symptoms include discoloration or sores around the mouth, and sometimes diarrhea. It can be treated with anti-parasite medications and can be prevented with good hygiene and regular cleaning of cages. Doves that do not receive enough direct sunlight are prone to vitamin D deficiency. Birds kept indoors should be supplemented with UV lighting. Another dove/pigeon species to consider is the Victoria crowned pigeon. Otherwise, check out all of our other uncommon pet bird species profiles.